Proven direct descent from a Dutch settler born in the Netherlands, and, who immigrated, no later than 19 April 1775, to any settlement in what is now the United States. 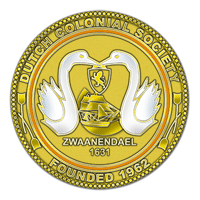 Also eligible are direct descendants of selected non-Dutch ancestors who settled what is now the United States no later than 19 April 1775, AND who have proven significant service to Dutch heritage in business, cultural, military, religious or political affairs either in the Netherlands and/or the United States. Proven direct descent from any native of the Netherlands who settled in the United States after 19 April 1775. Both Colonial and Non-colonial members have the right to vote and hold office. Members may reside in any part of the United States, and their eligible ancestors may have settled anywhere in the colonies. Therefore, the Society is national in scope. While membership is by invitation only from the President of the Society, membership inquiries are welcome. Upon written acceptance by the applicant to the President, the Genealogist will provide an application form (electronic or paper) for completion. If the applicant has a recently approved lineage paper from another recognized hereditary society, it may be used as documentation as evaluated by the Genealogist. All other applicants must provide satisfactory and supporting proofs for each generation.